The art of creating has to be applauded. It brings meaning, color and a sense of purpose to fashion. What is so appealing about Pakistani suits and couture wear is their unique take on fashion. 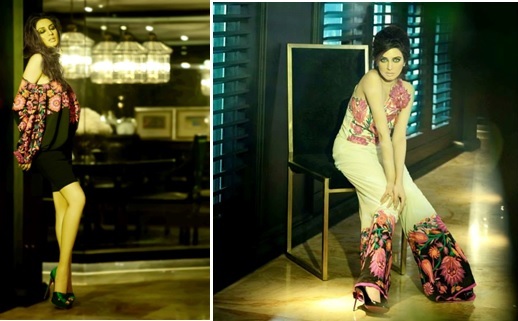 These fashion creators who have built luxe lifestyles have brought out “tehzeeb” of Pakistan through their clothes. 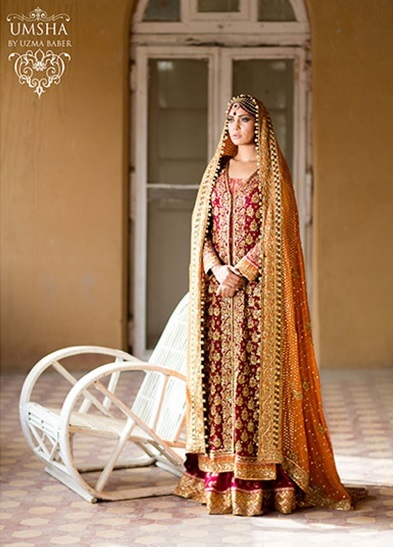 Lehengas, shararas, sarees, kurtas, sherwani’s etc are an integral part of Pakistani fashion. What really differentiates Pakistani Couture from Indian Couture is the interpretation of the same concepts in different colors weaves and designs. 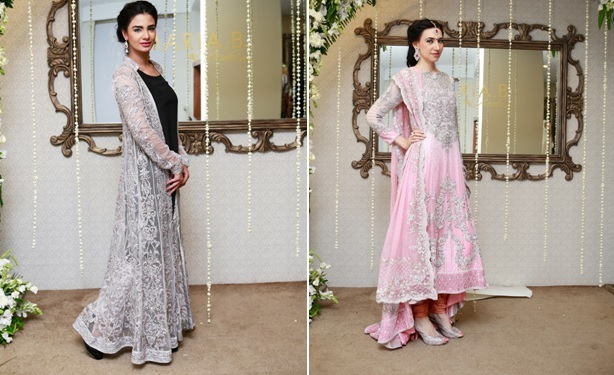 Various Pakistani designers have interpreted Mughal era clothes to fit modern sensibilities. Pakistani interpretation of western wear is married beautifully to their traditional tastes. Wherever needed Pakistani fashion has adapted to western wear with their cultural twist. It is interesting to see that Indian and Pakistani fashion is so different despite having access to the same textiles, karigars, colors and cultural heritage. Pakistani suits and couture wear is not heavy – in the sense that their climate, their cultural sensibilities do not prefer “heavy clothes.” So you might see richness in design, but you will not see the unnecessary burden of textiles (in terms of layering). 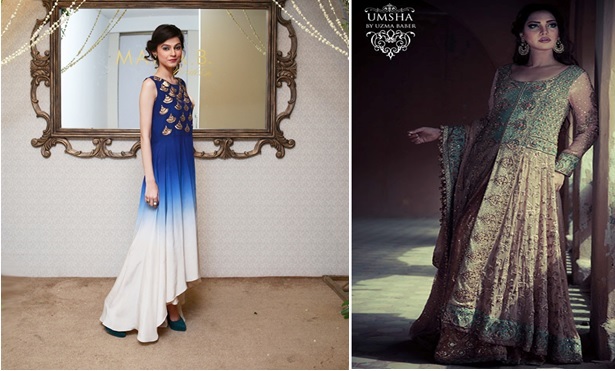 Looking at their casual, formal and bridal wear, let us journey into what 2014 looks like for Pakistani fashion. The Pakistani casual wear is their modern take on salwar kameez . Be it the short anarkalis which are reminiscent of the 90’s yet look chic and fun, to chiffon and charmeuse silk combination which is tastefully designed for a cool look. Notice the cigarette pants with an unusual kurta cut. Pakistani suits are not slave to a particular fashion style. The variety of cuts, lengths and material only add to the versatility and timelessness of wearing such an outfit. The short anarkali has been modified with bell sleeves and a cinched waist with slim salwar pants to give it a casual, more roomy and comfortable look. Also the slim pants have different lengths – from the traditional churidar, above the ankle length, or flared ankles with a cut. What is really appreciable about Pakistani suits is that the clothes seem to have a character- the wearer here has to really identify what will look or suit her best. The world around, the rule of thumb becoming increasingly popular is for wearing clothes that bring out your personality. Here, clothes speak of a culture, heritage and image being portrayed by a modern woman. It is appreciable that beauty is celebrated with versatility instead of running behind the latest trend. The retro look being in, Pakistani fashion has a slightly different take on it. Look at the straight silhouettes and cinched waists. Also contemporary modern look is not overlooked – paneled kurtas with elegant motif embroidery is classy paired with cleanly fitted tights. Notice the shoulder embroidery. It is not left out of the patterned look of the kurta. Trousers which can be paired with tops as well as kurtas come in interesting prints which are usually seen on only kurtas in India. Moreover, these have an ankle length and can be paired with casual chappals. The fashion there has a section called the “Lawn” collection. It is understood to be linen or cotton material based, mostly for summer wear. Western wear such as jumpsuits, with sensible embroidery and the right material (georgettes, chiffons, mixed cottons) have been made to look chic and pretty. What we have also noticed in our research, that there is a demand for unstitched suit pieces. Most designer websites offer such a selection. Another notable piece is their love of embroidery, thread, embellishments, zari, lucknawi, kashimiri and mirror work. All these embroideries feature in their modern as well as traditional outfits. Whereas, we have let go of karigari/embroidery in our western wear, Pakistani fashion designers have found a way to incorporate and make it look beautiful. Notice the Kashmiri embroidery on the off- shouldered dress, the one shouldered jumpsuit and the blouse and borders of the saree. The saree in the picture is reminiscent of the Parsi saree with the difference of bold colors and needle work. Color combinations and elegant work are paired to make even the most western outfit appealing with a touch of culture and sophistication. 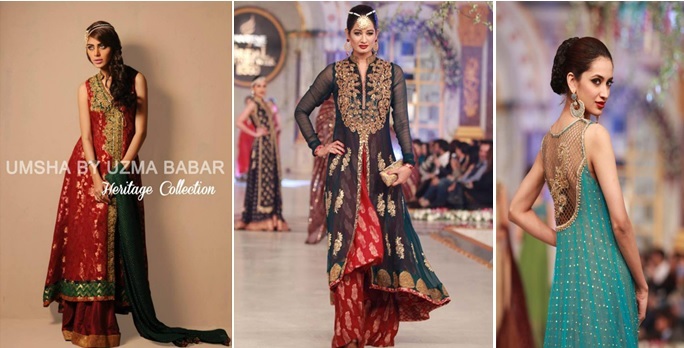 Though this short section will not do justice to the bridal collection that Pakistani fashion designers have brought out for the year 2014, it will definitely give you a peek into the world of Pakistani bridal wear. 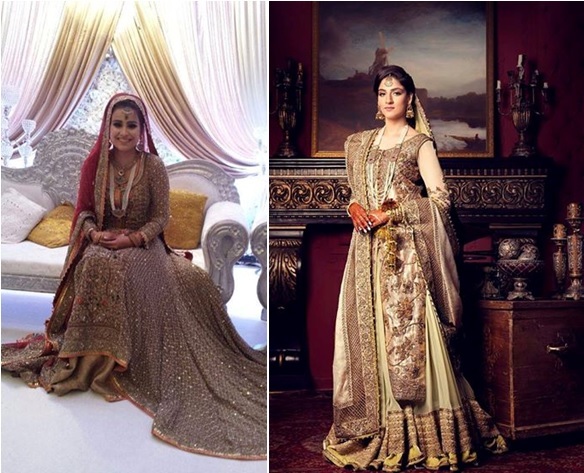 The biggest influence on Pakistani bridal wear has been the Mughal styles. The long embroidered jackets over kaliras, intricate and close fitted embroidery on the cloth speaks of the volumes of effort and time spent on each piece of cloth. 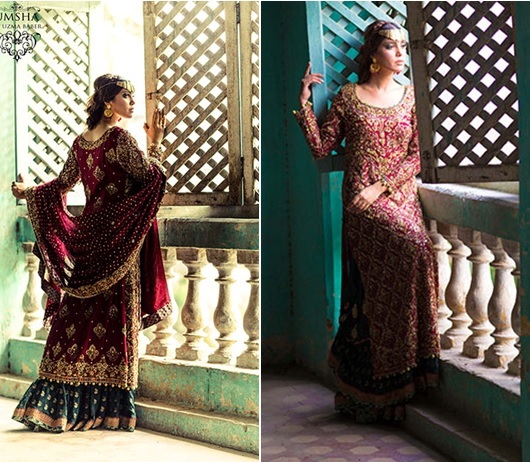 The Pakistani bridal wear is as complicated as the Indian bridal wear. Numerous panels on the wedding garment need to be embroidered separately before being stitched. In Pakistani bridal wear there are at least three to four layers – kalira pants, kurta, jacket (long or short) and the dupatta. If you look at the embroidery closely you will be able to see that currently the Indian trend is to go bold and big. This is actually reversed in Pakistani fashion. Traditionally the embroidery work is understood to be of supreme quality if you cannot see a shred of cloth beneath the embroidery work. Royals could afford such luxury. However, those who can still afford this luxury are few. 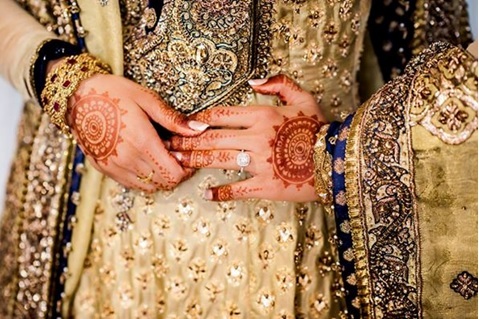 The picture above shows the intricacies of embroidery on a bride’s Pakistani suits. On both sides of the border you will see that the embroidery is now spaced out (more so in Indian bridal wear). In Pakistan, preference is still for closely spaced embroidery. Notice the small embroidered motifs on the kurta and then on the edges of the dupatta, where even the piping has embroidery on it. The length of the bridal wear is also of note. Feminine yet graceful, you can also interpret it as having a sense of modernity. A long Kalira with a long embroidered coat will be coveted by a Westerner as it would be easy to wear yet pleasing to the eye. Also, the drapes of the lengthier garments are carefully done so that they fall gracefully on the bride. These pictures tell a story of how popular brocade, net, georgette and chiffon are and how cleverly they have been married together to make the bridal wear unique and appealing. Most of all, we notice that the designers of Pakistani fashion are confident of their heritage and style. It is inspiring to see that we share the same confidence being reflected in our traditional wear. Style inspiration from this couture is something which will look good in India as well. The embroidery is breath taking and the color combinations are to our liking as well. The bridal section is exhaustive as each designer has his or her own take to the traditional wear. We do hope to do an extensive coverage of their bridal wear for you to take inspiration from, soon. Share with us your thoughts on this article as we would love to hear from you!